Finally an update from my part! Not finished though, because a lot of other commitments, lot's of sculpting and a lot of research on where to get things (also, income is only once a month atm). 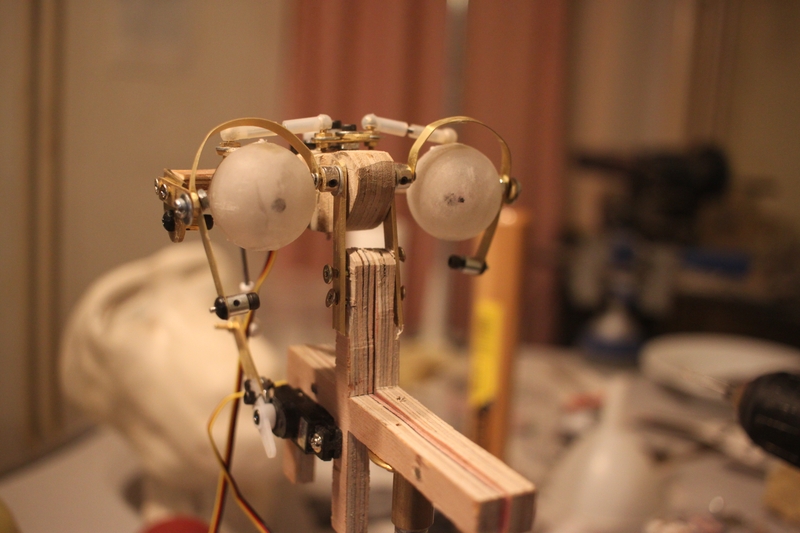 I'm calculating on finishing an acceptable model before the 15th of January as for I'll use the animatronic to apply for a subsidy from my government, which -if succeeded- would be nice to buy materials for my workshop and the upcoming live course about arm mechanics for animatronics. 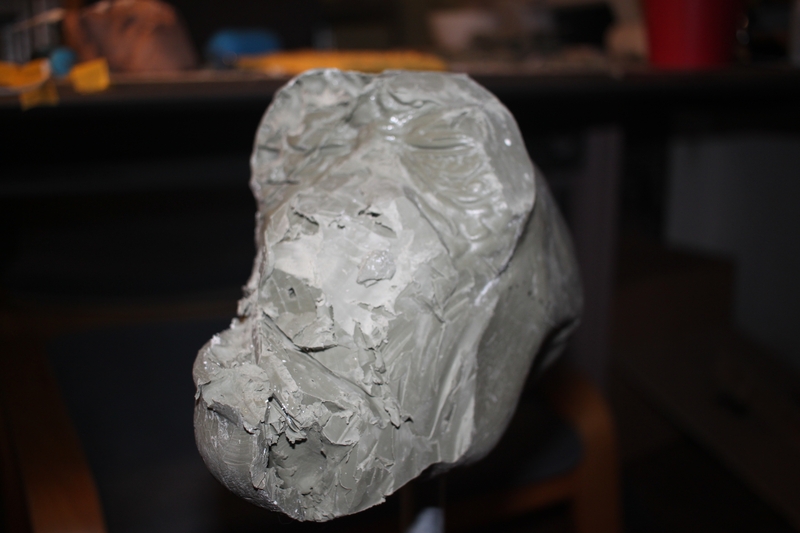 So let me first introduce you to my sculpt. To be honest, I took too much time to put in details. The reason for this was because I thought that I needed this base form of the chimpanzee with as much as possible details. And for me, this sculpt isn't even the finished thing. (In my head I'm dramatic when it's about finishing art related things, it never ends!). 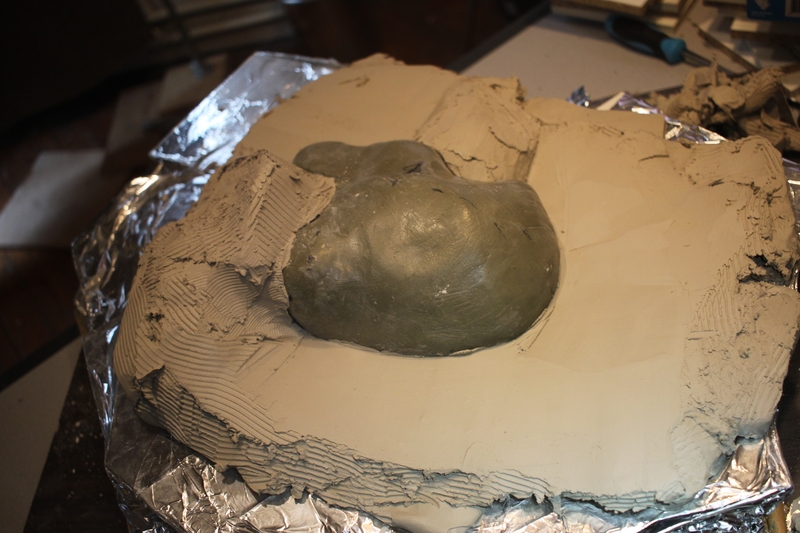 I could just do less details, basic form, toy around with gypsum plaster to make a stone mold (which I have never done before actually, so got into those tutorials too) and get on with it, but no.. I actually took all that time because I'd wanted it as close as perfect for me because I didn't felt like spending a second amount of time and money on it. But at the end, Gary Yee is right, one needs experience to be good at something like this (he was refering to mold making, I refer to all of it ). 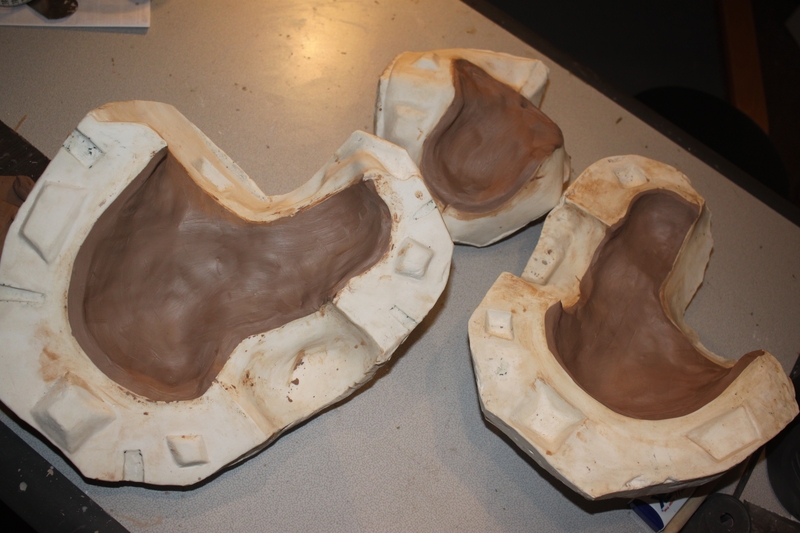 I want the front to be a mold piece that slides off from the other two pieces. Maybe it can be done with 2 pieces, but whilst I'm learning, why not give something more difficult a try. The skin will be made from Smooth-on Ecoflex 00-30. I bought 2 batches of trial, I guess they'll be more than enough for one skin. I had to disassemble this one because I used epoxy putty (too heavy) to attach the eyes to the brass tube and the holes in my brass strip from the little T section weren't straight in the middle, so at one moment the servo stopped doing the movements and I figured out that I had to redo it all. 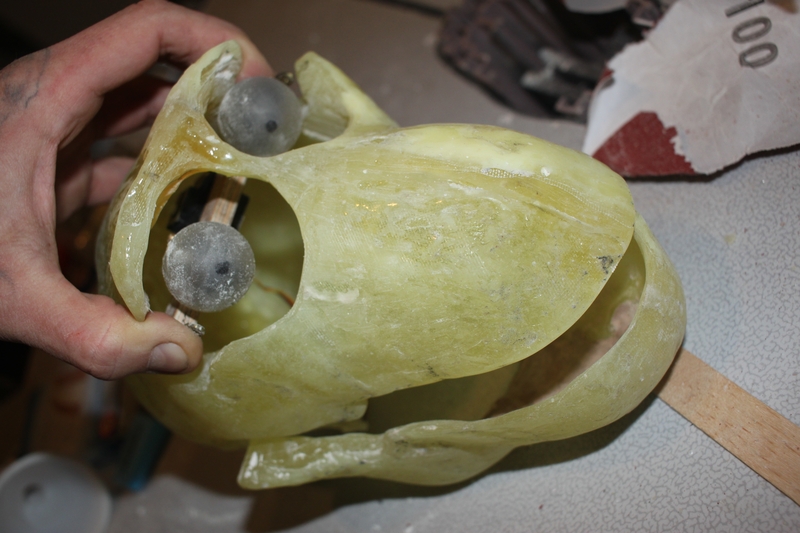 I expect to have the stone mold, inner core, fiberglass underskull, skin and working mechanism finished in aprox 2 weeks from now. 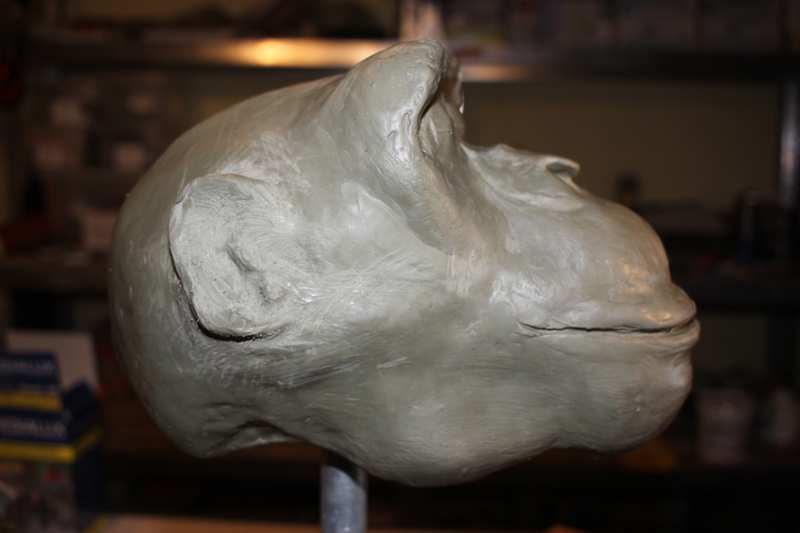 I am mostly happy that I got over it to leave the sculpting behind, because atm, I don't want to see any more chimpanzee pictures or movies. I was lost in it because I have this obsession with getting it anatomy correct, and I'm still not satisfied with it so I'm curious how it will look like if it has skin, paint and hair. 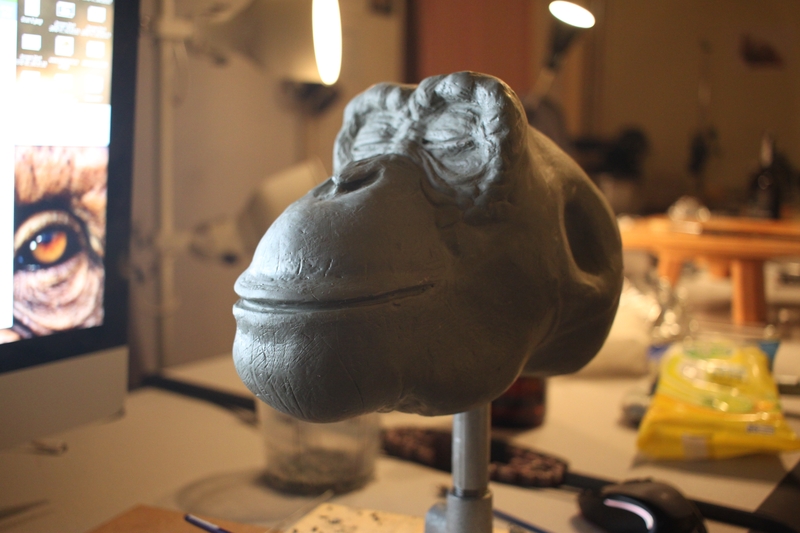 For the eyelids I was thinking to sculpt a separate piece that I can simply glue with pros-aide to the hero skin afterwards (because unlike humans, a Chimp's eyelids really disappear in their eye sockets like they are folding up above the eye). But if I'll do that, then I must consider to design something smaller/thinner than just a brass strip that has been bend. Also the jaw servo's won't be housed into the underskull when I'm getting there, but I have to calculate forehand how high my chimp his chest will be, thus I'll attach the plate that houses the servo's lower than the head and the underskull I'll mount on iron pipe fitting bars (just like I sculpted it). If there is some spare time left to break my head about how to do the head on neck movement, I'll do, but I already had some ideas. It was really delightful to be a part of this live webcourse and it was my pleasure to spend money on it (Still is)! Thank you to Graic Caton, Matt and the crew! 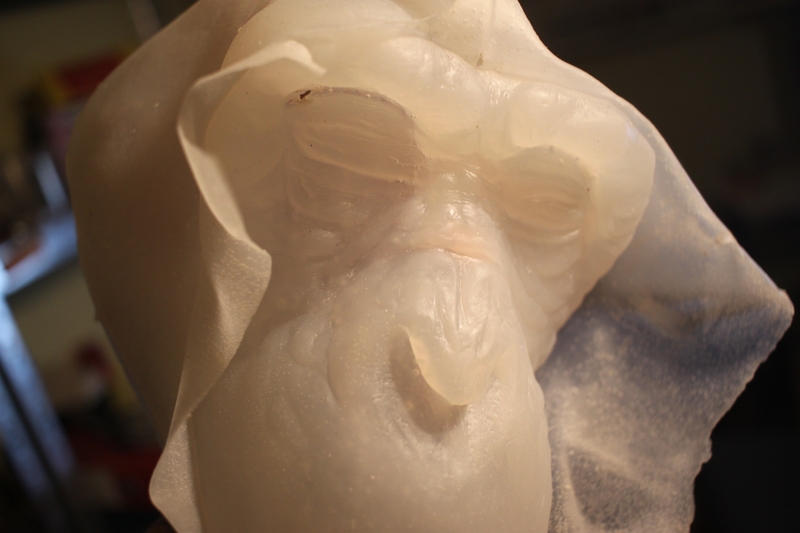 More updates on the forum to follow about my animatronic. 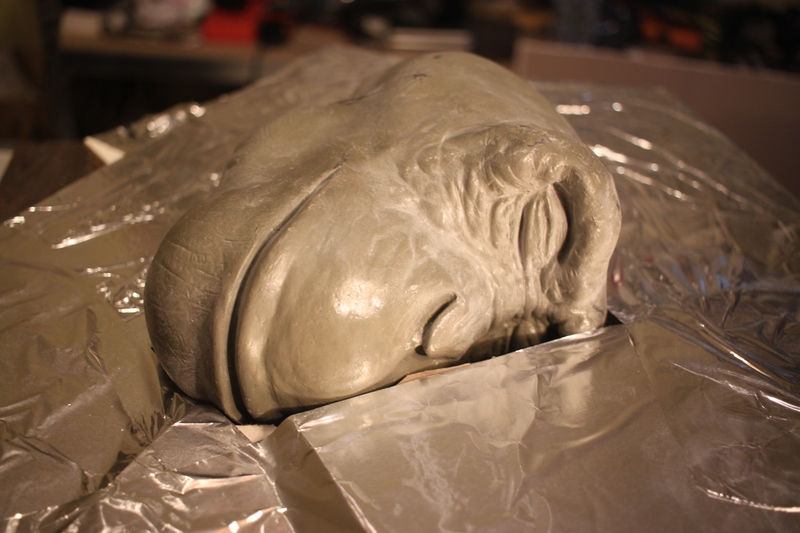 I have build the wall around my sculpt and I think that it's ready to get it's face coat of stone. I'm going to eyeball it a bit because I've got this feeling that my keys are too high. First of all, I wish you all a happy, healthy and prosperous new year! 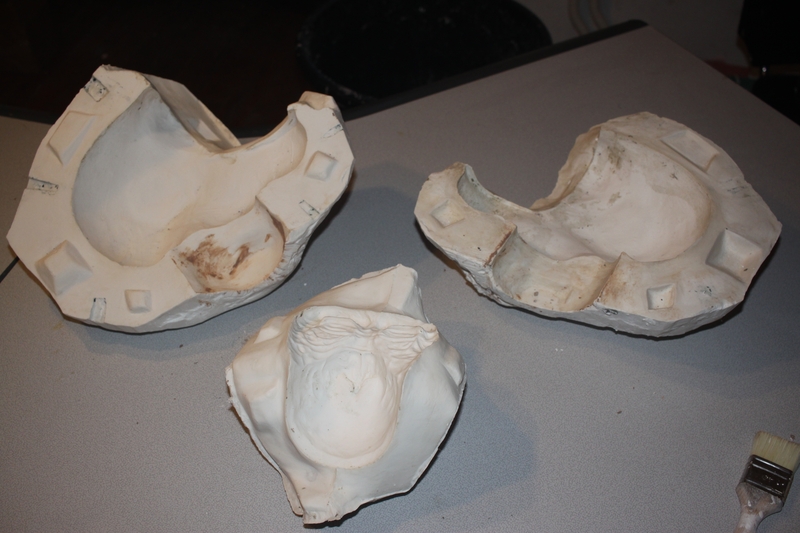 So, "twice" bad luck with pouring silicone in a stone mold. 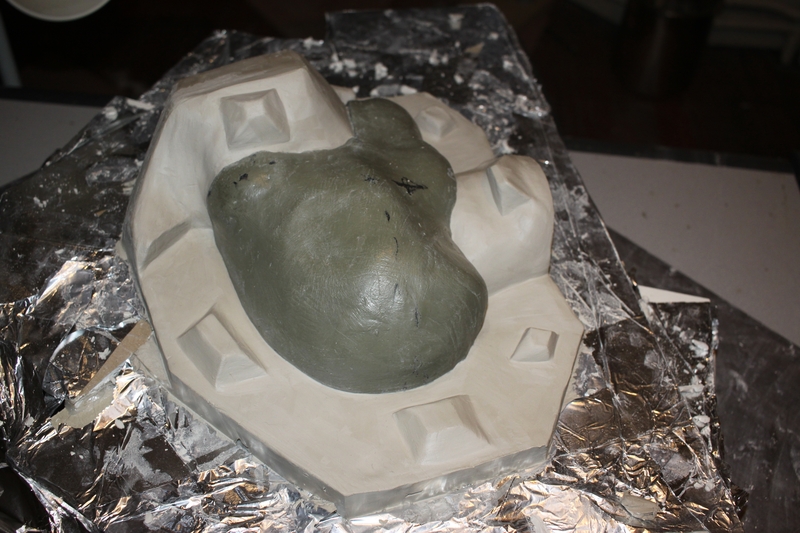 I did wanted to make a silicone mold at first but I never tried a stone mold, also I was short in product for a silicone mold. I just followed the lessons and stayed with stone, which was new for me. 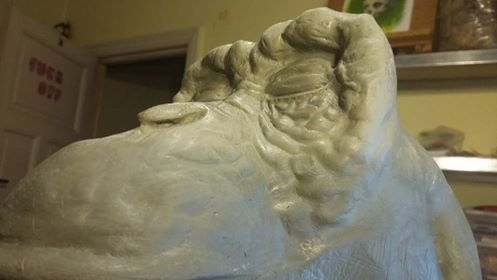 The white cast (Smooth on Dragon-skin) actually didn't fail in my eyes as for that was all the product I had left from a mold I made in another project, I figured out to cast it in the stone mold because of shelf life and also to see what it would give. 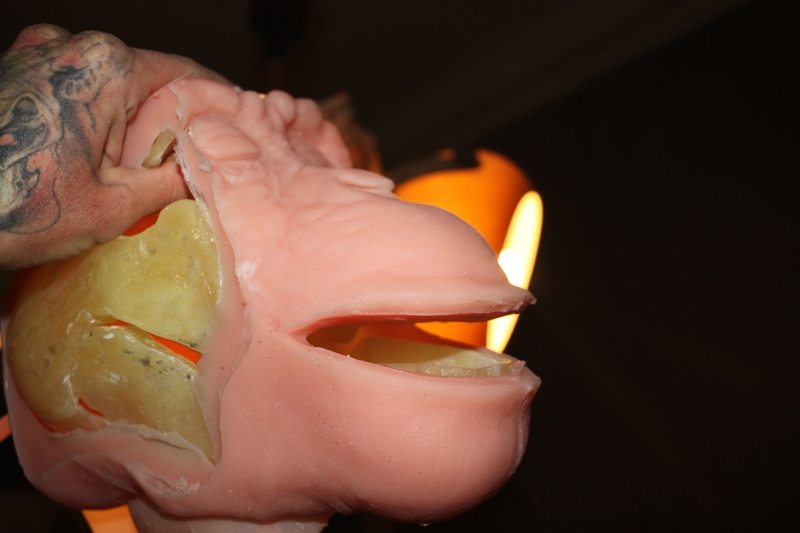 For the lips movement, I think I'll put in one or two extra servo's, the Eco-Flex is a really neat silicone for animatronics and I stretched the underlip quite far, calculating if it would be possible to do And the hoot-face And smile/ talking. In my opinion it should.. Probably I'll jump over to 3d modelling for this one, or zbrush redo. Maybe 3D scan it first. 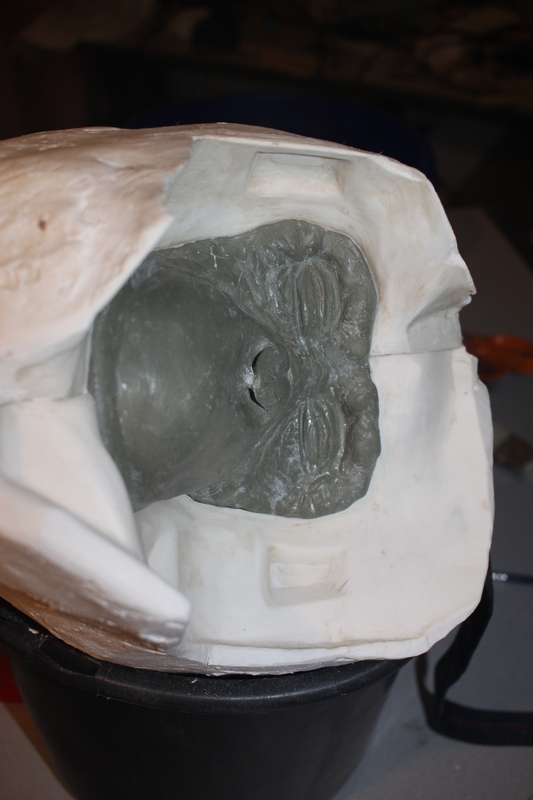 As when I starting to make the core, I figured out he was quite asymmetric, I didn't noticed this while sculpting (maybe I was too lost in some details, because I re-did the face like 3 times). A mistake I made is that I sculpted him with his eyes closed, When putting one of the skins on it, I saw straight how difficult it would be to get the desired effect of his eyelids to open properly. Anyway, I learned a lot of new things and even if I didn't manage to finish the eye mechanism and the chin/lips movement, I'll keep updating this post as whenever I get furthermore with this project. I'm looking forward to the upcoming animatronic lessons regarding lip movements and arms(&legs?) mechanics! And a quick update. 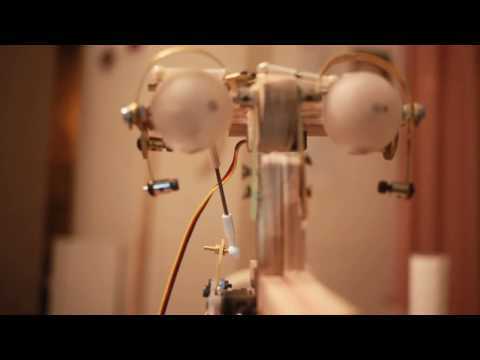 The video comes with a question about noise made from the smallest servo.. It has trouble reaching the position you're trying to send it to. Most of the time this happens when it has to overcome a lot of friction, being prevented from moving all together (running into something), or when there's something pulling on it (like a weight hanging from it). It's a common problem with these small servos.